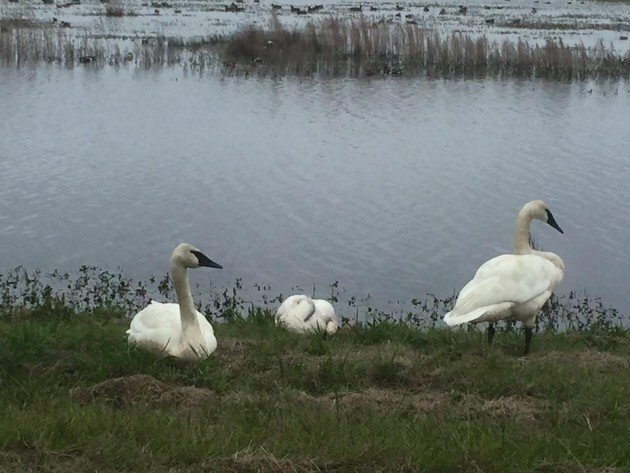 For the past several weeks a pair of Trumpeter Swans have made themselves at home along a road through Mattamuskeet NWR in eastern North Carolina. Trumpeter Swan is a serious rarity in the state, and indeed anywhere in the southeast. But as the re-introduced population around the Great Lakes begins to pick up steam, it’s a species that has been discovered more regularly in North Carolina, and has been annual the last three years. Most birders expect that trend to continue as the population recovers from extirpation in the east. The unique thing about these particularly Trumpeter Swans is their remarkable naivete. Apparently this is not uncommon for this species, but it takes some getting used to for a birder to pull up alongside what is an ostensible rarity in the state and snap a photo of the birds with your cell phone as you idle in the road. I know this for a fact, because this is precisely what I did last week when I spent a day in the eastern part of North Carolina chasing rarities. The other birds took some doing to find. These, however, were as wary as lawn geese. So that’s certainly weird and all, but here’s where I ratchet up the weirdness. The birds were originally reported about two weeks before I saw them as a pair. However, one of those was evidently injured or sick, as it would spend a great deal of time sitting on the bank with it’s head on or near the ground. It was lethargic, and unconcerned with people nearby even though the other member of the pair seemed healthy enough, relatively speaking. There was a lot of speculation about precisely what was doing the swan in, with suggesting ranging from lead poisoning to toxic mold ingestion (the surrounding fields where the swans typically forage during the day have been exceptionally wet and the weather has been exceptionally mild so far this winter, excellent for fungus). One of the rangers at the refuge had some photos showing an injury on the bird’s breast, likely from a gunshot wound as the refuge is a popular site for waterfowl hunting, including hunting the thousands of Tundra Swans in the area. The working theory was that the injured swan could not manage, and the second swan might have been its mate. It wasn’t long before the swan succumbed to injury or illness and the specimen gathered and sent to the state museum. All this happened the day before I was planning on heading out to see them, so I was worried that if the second swan was a mate, that it would head off into the dense waterfowl flocks and become significantly more difficult to find. But that didn’t happen as you can see form my photo. The next day I came upon two swans right where they were supposed to be. But wait. Wasn’t one supposed to be dead? I guess so. And as soon as it died another Trumpeter Swan, and I should remind everybody that this is a rare bird for the southeast, took its place next to the first one once more. So there were at least three in the area, and one of them was apparently eyeing the situation closely and looking to swoop in when the opportunity presented itself. But this is where it gets weirder. It wasn’t long before these two swans I had photographed also died. Perhaps lead poisoning, perhaps toxic mold, perhaps whatever. Swan mortality is a bit of a black box and the results from testing the carcasses has not come in, or at least I have not heard it. It’s sad to see these birds go, but they provided a great deal of excitement for the birding community so they did not die in vain. But a couple days later guess what was back at the same spot on the side of the road. If you guessed two more Trumpeter Swans, then you win the prize. Now the answer obviously is that there are more Trumpeter Swans among the Tundras at Mattamuskeet than we realize. The swans are scattered widely across a very very large lake, so they’d be easy to miss. But why are they coming back to this same spot over and over again? I’m not sure I’ve sufficiently ruled out the possibility of some sort of worm-hole that cuts across space and time, or these are resurrecting swans and they represent some sort of swan messiah. We may never know. I look forward to next winter, though, and the hopes that the swans will return once more. Excellent blog post! Beautifully written and relevant supportive photos were nice. Very interesting. 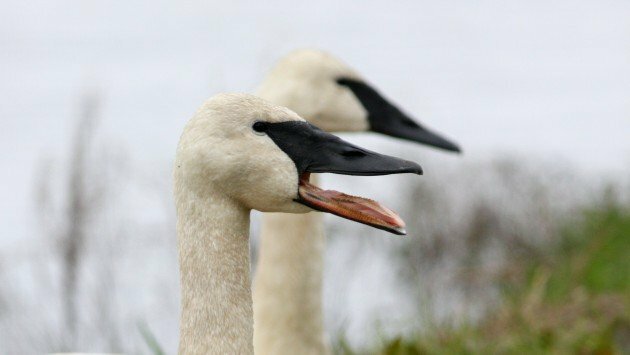 Would it be possible for you to follow up on the post-mortem exam results on the swans? My daughter is a science writer and I’ve asked her if she has time for follow up, but she is swamped at the moment. My email is SiliconValleyWildlife@gmail.com if you prefer private communication. There seems like there is likely more yet to this story. I favor the wormhole theory, myself, but also have you considered the possibility that whole park is caught in some kind of avian Groundhog Day scenario? Possibly that third swan needs to learn some valuable lessons about life and love.